Hand-crafted here in the USA of durable and beautiful white cotton duck fabric bleached in environmentally friendly hydrogen peroxide, with rustproof nickel plated brass grommets. 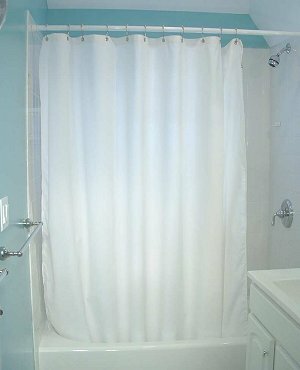 The curtain will stop water from spraying outside your shower without a plastic liner. This keeps unnatural plastics out of our landfills. The shower curtain will get wet, but will not leak through. The cotton shower curtain will rapidly air dry which prevents mold growth associated with plastic liners. The curtain's natural cotton duck fabric is not organically grown but is processed without chlorine bleach, dyes and finishes normally used in the industry. The cotton shower curtain resists mildew and mold by drying quickly and not trapping moisture against the inside of the tub like plastic liners do. After showering simply spread the curtain out so air can dry it, try not to leave it gathered at one end of the tub. This curtain does not have the annoying property of billowing out towards the shower spray like lightweight plastic liners do. Using your Cotton Shower Curtain demonstrates your concern for our planet's environment by reducing chemical and plastic use, reducing landfill mess, as well as beautifying your bathroom environment by bringing nature into your everyday life.